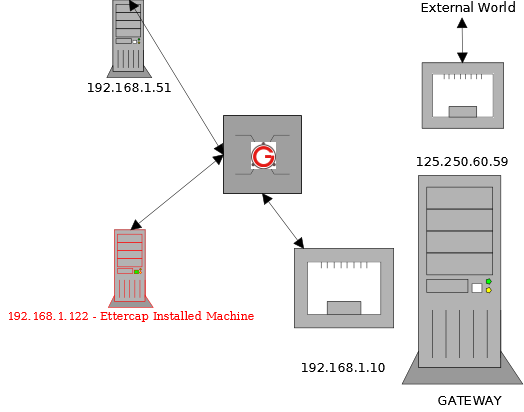 Ettercap stands for Ethernet Capture. It features sniffing of live connections, content filtering on the fly and many other interesting tricks. It supports active and passive dissection of many protocols and includes many features for network and host analysis. Download the install the Ettercap package from Ettercap. 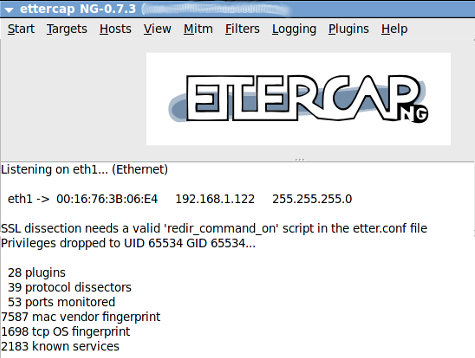 This article explains how to perform DNS spoofing and ARP poisoning using Ettercap tool in Local Area Network ( LAN ). Warning: Do not execute this on a network or system that you do not own. Execute this only on your own network or system for learning purpose only. Also, do not execute this on any production network or system. Setup a small network/system for testing purpose and play around with this utility on it for learning purpose only. In this article, we will mainly focus on the “Graphical GTK User Interface”, since it will be very easy to learn. We have already explained about why we need ARP and the conceptual explanation of ARP cache poisoning in ARP-Cache-Poisoning. So please have a look into it, and this article will cover how to perform it practically. The following diagram explains the network architecture. All the attacks explained here will be performed on the following network diagram only. Using Ettercap in a production environment is not advisable. Launch Ettercap using the following command in the 122 machine. Click “Sniff->Unified Sniffing”. It will list the available network interface as shown below. Choose the one which you want to use for ARP Poisoning. The next step is to add the target list for performing the ARP poisoning. Here we will add 192.168.1.51 and 192.168.1.10 as the target as follows. 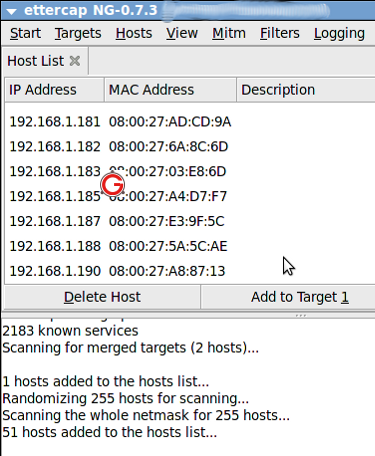 It will start to scan the hosts present in the network. Now among the list, select “192.168.1.51” and click “Add to Target 1” and select “192.168.1.10” and click “Add to Target 2”. The concept of DNS is as follows. Here we will see how we can spoof the DNS. There are many plugins which comes by default with EtterCap. 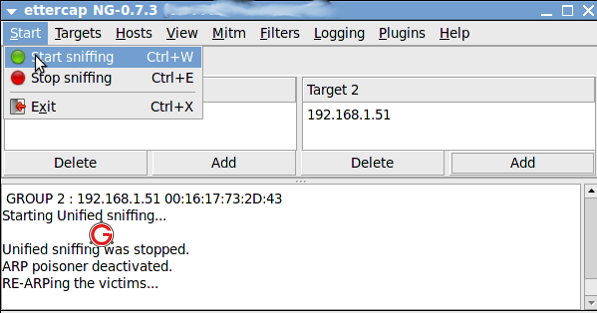 Once such plugin is called as DNSSpoof. We are going to use that plugin to test the DNS spoofing. PING google.com (192.168.1.12) 56(84) bytes of data. You can see that it returns a local machine’s IP address which we have given in the configuration. Finally, it doesn’t hurt to repeat the warning again. Do not execute this on a network or system that you do not own. Setup a small network/system for testing purpose and play around with this utility on it for learning purpose only. Can “ARP Poisoning” be done in wireless network ? Can we detect this type of attacks with SNORT ? Why am I not able to select wlan interface for sniffing. Is it the Support for drivers(ettercap drivers) to work promiscuous is not integrated? Same thing I have observed for wireshark. Wlan is there for quite sometime but still I don’t find any sniffing tool which works with wlan. Is there any complexity in making wireless lan work with sniffer? Thanks for the wonderful article. Keep up the good work. I don’t have a wireless lan with me. So I’ve never experimented it. I’ve not tried it. There are other tools which helps to detect the ARP poisoning. You can also try “arpalert”. Very useful article. Thanks a lot for sharing such knowledgeable things. hi. i have virtual machine backtrack OS .and i do successfully mitm on my window xp….and got all the ssl logs… in Lan all successful execute as i say i have two ip ..lan is .192.168.1.x…and wan ip is 122.145.23.x like that..scan wan ip i got result many host ip live . …here is the question how can i redirect all outgoing and incoming traffic of these wan ip’s through my host computer..
From what i know is, the wlan need to support monitor mode so u able to MITM. What OS this tutorial is about? There is not /usr/share/ettercap/etter.dns in my Linux Backtrack 5 R2 !!! Can you please let me know the spoofing with the DNS? DHCP restricts it to access. for Wireshark have you spawned the process as root? Otherwise you may not find any interfaces for sniffing. It also does work with wireless; once you start the capture on your wireless interface you should see packets start appearing. I am using a kali and did changed the etter.dns for gmail to my ip but while i open with firefox at the client the firefox does not open to the neither of the page neither official gmail nor to my ip host server it shows certificate error of hsts and also didn’t work with chrome also. Great! solved my problem while I bump into Ettercap.